Bossy Italian Wife : Homemade Perogies!!!!! If there is one thing in this world that I love it's pasta filled with anything. I grew up eating Mrs. T's perogies, like a lot of children. 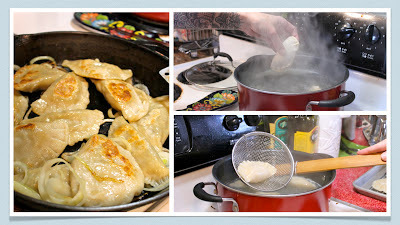 I even tried my hand at making my own perogies about a year or so ago. What I can now tell you is that nothing compares to a bonafide recipe from a Polish family. 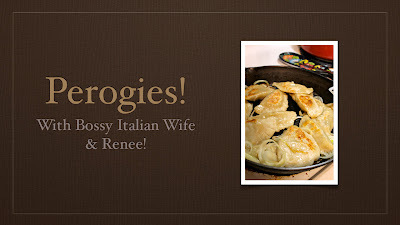 If you don't know what a perogie is, it's a wonderful pillow of sour-cream laced dough that has been stuffed with filling of your choice--potato and cheese or sauerkraut seem to be top choices. It's basically the ravioli's polish cousin, and I have a healthy appreciation for them. When I saw that my friend, Renee had been making them, I invited her over to teach me the secrets of her people. We started on our filling straight away. To save time, we did a mushroom and sauerkraut filling. Renee was careful to point out that a lot of this personal preference--so you can always change the filling, add more, add less--you know, that sort of thing. 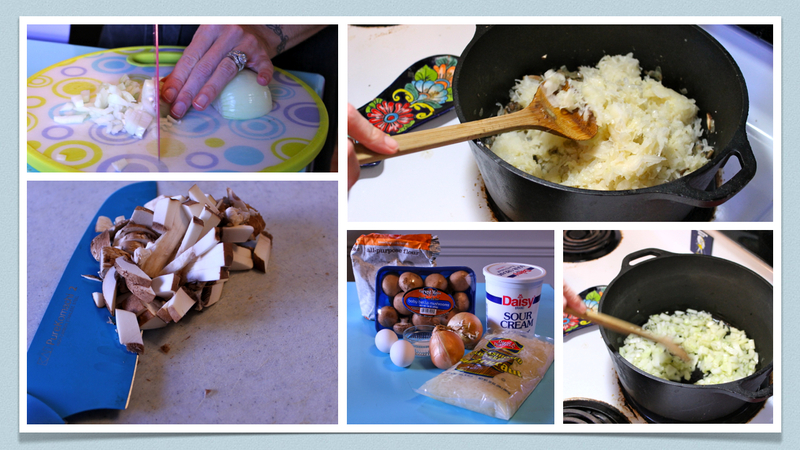 Anyway, we used a couple of onions, a pound of mushrooms and two pounds of sauerkraut. Sautee your onions first, then add mushrooms, let those cook a bit, then add your kraut. Bring it to a boil, reduce heat, cover and then let it go! Now, we actually rolled the dough two ways. I have a pasta machine, so we tried using that. Then we switched it up and Renee showed me how she rolls by hand. I can't honestly say that the machine was a better option in this case because this dough rolls out so easily. Thickness of the dough is also a personal preference. If you like it a little thicker--do it thicker. We went back and fourth testing different thicknesses and settled on somewhere in the middle of thick and thin. 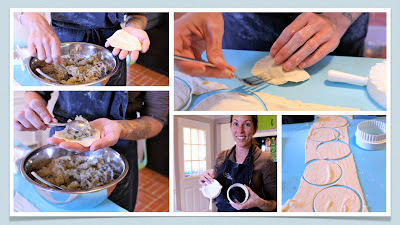 By this time we were ready to fill our dough and make the perogies. Drain off your filling to get the water out and put it in a bowl. When it comes to filling the perogies, we again tested two methods. The first was hand filling them. The other was using my dumpling press, which I picked up at my kitchen for about two dollars. So I ate it...raw. I am happy to report that eating the perogies raw was nearly as pleasurable as eating them cooked. Now, since my attempt at filling them by hand went so badly, I decided to use the press, which was easier. You can see the side by side comparison there--which of course isn't allllllllll that different. When you are ready to eat them, boil them in water for about 10 minutes, then lay them out on a cooling rack brushed with olive oil. From there, you can freeze them for later use. I like to fry mine up in a pan, and Renee suggested I add some onions, which I did. They were so delicious. So. Delicious. I didn't know it was possible, but after making them, I am more in love with perogies than ever. In a dutch oven, heat olive oil over medium high heat. Add your diced onions and sauté until they are getting golden, about 5-7 minutes. Add your mushrooms and cook another 8-10 minutes. Drain your sauerkraut and add to the dutch oven. Bring it all to a boil, then reduce heat to low, cover and allow it all to cook while you are making the dough. *If you are finding it is gathering a lot of liquid, you can take the lid off and raise the heat slightly to boil it off. In a large bowl or on a dough board, place your four cups of flour and make a well in the middle. Add your eggs to the well. Then add the teaspoon of salt and the sour cream. 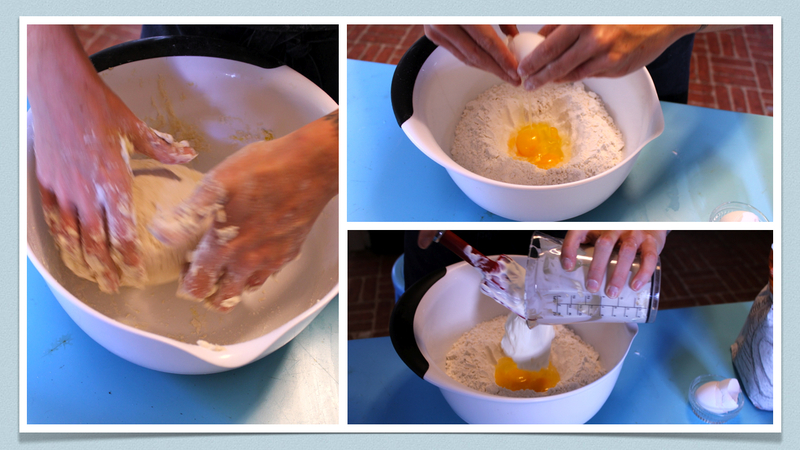 Using your hands, work it into a nice dough, combining fully. If the dough is too moist, add a bit of flour until you reach the desired consistency. 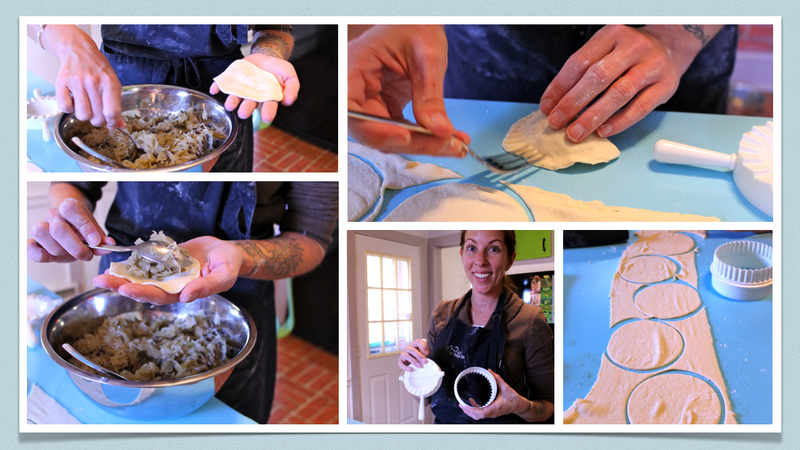 You want to be able to handle the dough without it sticking to your hands. Smooth, as I like to call it. Once the dough is ready, you can either use a rolling pin or a pasta machine to roll out your dough. How thick or thin you like the dough is a personal preference. We went somewhere in the middle of thick and thin. On my pasta machine, we really liked the "3" setting. Either way, roll out your dough to desired thickness. At this point, you'll want to take your filling off the heat and drain off any liquid that is hanging about. Put your filling into a bowl. 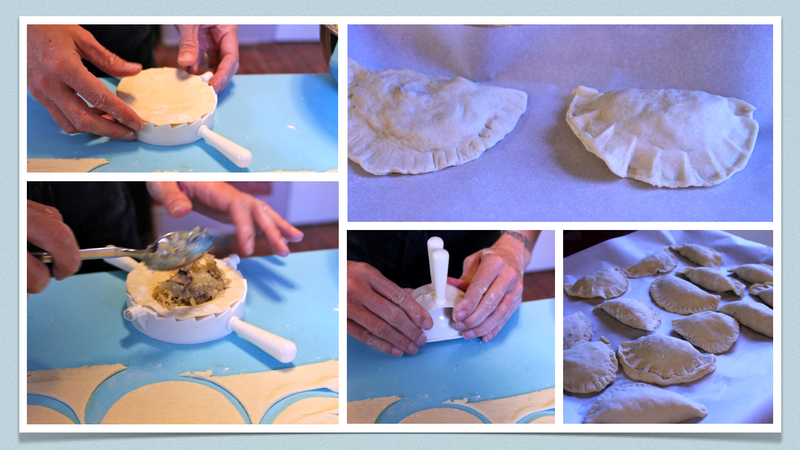 Using a dumpling press or a round dough cutter, cut dough into rounds. Using a teaspoon, spoon filling into round, careful not to fill too much. Pull the ends together (or if using a press, press the edges together.) If doing them by hand, use a fork to seal the edges together by pressing the fork into edges, carefully avoiding the filled portion of the perogies. Set aside finished perogies on a pan prepared with parchment paper. Repeat until you have used all your filling and dough. Boil perogies in water for ten minutes. If desired, fry in a pan with butter and onions. If freezing, set cooked perogies on a cooling rack brushed with olive oil and allow them to cook before freezing. I also froze some uncooked perogies, which I plan on boiling for 10 minutes to cook from a frozen state. If you are going to freeze the uncooked perogies, lay them out on a pan with parchment paper and freeze individually and once frozen, transfer to a container.